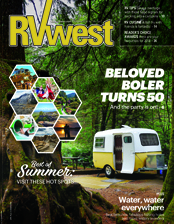 Welcome to the eMagazine version of RVwest. 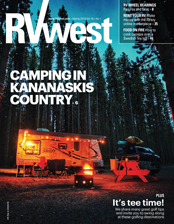 Our eMagazine is an exact copy of the print version of RVwest, so it gives you all the same great articles in an easy-to-read format. In addition, it provides immediate links to any online resources you come across in the magazine. To receive an email notification each time the latest eMagazine is ready for viewing, please go to our subscription page and check the box that requests the eMagazine. Dream of going North? 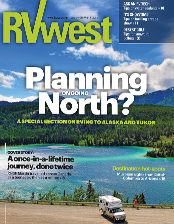 In this issue we present a special section on RVing to Alaska and Yukon (and it includes taking a ferry to see glaciers). Our cover story features Ralph Martin, who travelled across Canada twice—once as a teenage and then as a retireee—and wrote a book about his adventures. Plus we’ve got tips on everything from attending a trade show or taking an RV factory tour to dealing with water leaks as soon as possible. 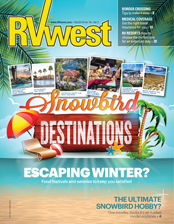 In this issue, we feature great snowbird destinations and some apropos tips, such as buying medical travel insurance, choosing the perfect RV resort for an extended stay and making the border crossing easy. And speaking of snowbirds, our cover story features Jonathan Smith, who thinks the ultimate snowbird hobby is jet-fuelled model airplanes. We also summarize the massively changed rules of golf that roll out on January 1st. In this issue, we showcase a variety of water-focused adventures in Western Canada as well as a few U.S. locations. It’s summertime, after all, and RVers are heading to lakes, rivers and oceans, not to mention looking for that prime fishing hole. We also offer a couple of great fish fry recipes, and some practical advice on backing up trailers into campsites. Plus, we feature the history of the iconic Boler trailers, which are celebrating their 50th anniversary in Winnipeg, Manitoba. Finally, don’t forget our Reader’s Choice Awards, where we list your favourite 2018 destinations. In this issue, we offer some novel ideas, from making money renting your RV when you’re not using it to cooking lunch on a Swedish fire log. Our cover story will inspire RVers to bring their canines camping. We also share many great golf tips and invite you to swing along at some great golfing destinations. And don’t forget the annual maintenance on your RV wheel bearings.